The Celebrate Team is composed of high school seniors aided by adult advisors and meets weekly. The Celebrate Program incorporates Scripture, faith-sharing, personal witness, and sacramental formation while inviting seniors into a deeper relationship with the Lord as part of a close-knit Christian community. The program culminates with a weekend retreat for juniors in the spring. Facilitated by a team of high school seniors, the Celebrate Weekend is a special retreat designed for juniors only. A unique experience, this retreat nurtures a sense of community while creating an opportunity for all involved to enrich their relationship with the Lord. In 1975-76 Ronald Garmey, Youth Ministry Catechist at St. Joseph and Fr. Daniel Venglarik, Ursuline High School Catechist, shared an idea they had with Mary Ann Conway Itts, the St. Joseph Parish Director of Religious Education (DRE). 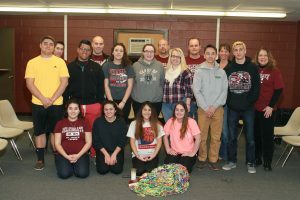 Their idea was to develop a youth retreat program that would include the Fitch High School students, and the Ursuline High School students. The goal was to help all of the parish youth to see themselves as part of the parish community. At the time, two existing programs were the inspiration behind this endeavor. RENEWAL: a parish adult retreat just beginning and having an impact on adult parishioners. Against this background, could a program for the parish youth be developed? One that would be appealing to youth, and would also help them grow spiritually, and connect them with the church as they grew into adulthood? From that day on and all through the 1976-77 school year, many, many planning meetings were held. It was decided to offer the retreat to the juniors and ask them as seniors to return and prepare to put the retreat on for the next group of juniors. The team worked on preparing an overnight experience using insights gained from SEARCH and RENEWAL. Talks were prepared and activities were planned. In the spring of 1977, the adult team put on an overnight for the juniors and seniors. Susan Paczak was invited to give one of the talks. Following the overnight, John and Susan Paczak were added to the team. The overnight was very successful and the juniors were invited to return as seniors and put on the next retreat for the juniors. It was quickly decided that one overnight was not sufficient for all the team wanted to do and so we went to the two nights (Friday and Saturday) and added Sunday afternoon for the closing. The spring of 1978 was the first Celebrate Weekend put on by the seniors for the juniors. This year marks THE BEGINNING OF CELEBRATE at St. Joseph Parish, Austintown. At the conclusion of the first Celebrate Weekend, Fr. Dan and Ron Garmey went off the team. Celebrate has continued uninterrupted since then. It has since spread to other parishes like: Holy Family in Poland, St. Charles in Boardman, St. Christine’s in Youngstown, St. Patrick’s in Hubbard, and St. Michael’s in Canfield. Following each Celebrate Weekend, the program is evaluated. New ideas are incorporated, and the program continues to grow. May talks and activities from the beginning are still part of the Celebrate Weekend. Talks still include: Prayer, Christian Community, Leadership, Reconciliation, Acceptance, Love, and Eucharist. Activities still include: Bible Enthronement, Hugs after talks, Yarn Toss, Send in the Clowns, Singing, the Sacrament of Reconciliation, Mass, and Closing Ceremony. Donna Zielinski was teaching the Kindergarten CCD class and she suggested the title of her CCD book… CELEBRATE. We all liked it because it said what we wanted for our youth. We were CELEBRATING the good people they were and would become. We were CELEBRATING their growth in the faith and we were CELEBRATING their belonging to St. Joseph Church. The development of the senior program was a challenge. All the Sacraments were the focus for the senior year. In the beginning each meeting was prepared from week to week. Prayer, singing, the Sacrament focus, and planning for the weekend were all included in each meeting.